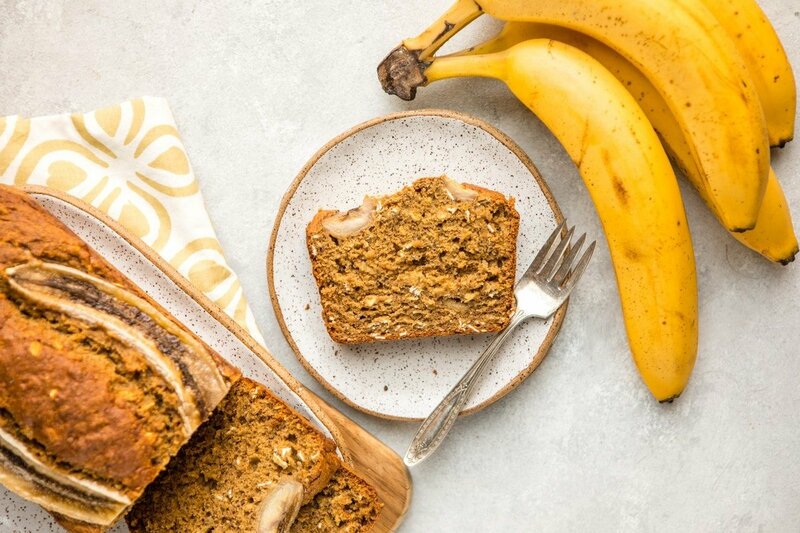 This Vegan Banana Bread is fluffy, gluten-free, and absolutely delicious. Plus, it’s actually healthy — and you only need 9 ingredients to make it! Note: This post has been updated with new photos and slight recipe modifications as of 01/2019. Ah, the classic Banana Bread. Are there actually people out there who don’t enjoy it? Personally, I have always loved it. I could eat it for breakfast, toast it up for an afternoon snack, and put some peanut or almond butter on it for an easy dessert. If we are what we eat, I may or may not be 50%+ bananas and bread. Are too mushy / gummy and have to be kept in the refrigerator. May not be made with the healthiest ingredients. This may be ok for a treat, but considering I can polish off a loaf in only two days, I want my loaf to be good for me too. Made with only 9 ingredients – that are also easily accessible! Now that, in my opinion, is a cause for celebration. So if you’ll excuse me, I’m going to toast up a thick slice of this masterpiece, crack open a bottle of my favorite kombucha, and relax on the couch. Hey, maybe I’ll even make some of my Baked Vegan Mac and Cheese to celebrate too. The more food, the merrier! As I have tested this recipe multiple times to ensure it’s deliciousness, I would strongly advise no flour substitutions. If you do decide to live life on the edge and do sometime differently (and it works for you) though, please let me know in the comments below and I can update the recipe notes. The Almond Butter in this recipe is really crucial for adding moisture and allowing the batter to rise. Make sure you use one that is smooth and drippy, preferably with no added oils or sugar. This is my absolute favorite brand and I would highly recommend it. If you’re looking for more Vegan Bread Recipes, you’ll also love this Vegan Zucchini Bread, Vegan Pumpkin Bread, and this Cranberry Orange Bread! In a small bowl, combine the Ground Flax OR Ground Chia seeds with 6 tbsp water to form an “egg.” Stir and set aside for 5-10 minutes. Place the Oat Flour into a medium sized bowl and add the Baking Powder, Baking Soda, remaining 1/2 cup of Rolled Oats, and Salt. Mix well and set aside. Add your ripe Bananas to a separate, large bowl, and mash with a fork until they form an even, runny texture. Add the Nut Butter, Coconut Sugar, Apple Cider Vinegar, Vanilla Extract, and Flax or Chia Egg to the bowl. Mix well. Slowly incorporate the dry flour mixture into the wet Banana mixture, stirring well and until all clumps have dissolved. Pour the batter into a parchment paper-lined or greased 8″ bread pan, smoothing the top off with a spatula. Coconut Sugar may be substituted with Brown Sugar or Cane Sugar. You can use any Nut/Seed Butter that you’d like for this recipe, but this will affect the final taste. I prefer to use either Almond Butter or Peanut Butter, but you can also use Tahini, Cashew Butter, or Sunflower Seed Butter! Hi Caitlin! This recipe looks great and I’m so excited to try it ?! Can the sugar be reduced or replaced by any liquid sweeteners like agave? Thank you!!! Thanks, Iva! Glad to hear that Almond Flour works too! just made this amazing recipe as I am taking a break from studying for nuclear medicine board exam! Thanks for yet another amazing recipe!! I have tried this with plain white sugar, sugar in the raw, and also truvia and they all come out great! You may not be able to use liquid sweetener, but you can definitely reduce the sugar if you like! YOU ROCK!! These ingredients are PURE, CLEAN, LEGIT! Greatly appreciated, making it now!! <3 yayyyy! Looks amazing can’t wait to try it out!! One question is it OK if I change almond butter to peanut butter ? Hi Anna! I believe that should be fine, as long as you are using natural peanut butter and that it is runny. Keep in mind that this will alter the taste of the banana bread though! I was just going to ask the same, good thing I absolutely don’t mind having some of that gorgeous peanut flavor with my banana bread. Hope you love it, Ariana! My husband is allergic to almonds and we didn’t have any peanut butter in the house, so I used cashew butter that was actually quite stiff and dry. The bread still turned out GREAT! It was moist and delicious. I’ll definitely be keeping this as my go-to banana bread recipe. this recipe looks amazing! i’ve been searching for the perfect vegan banana bread for a while. could i sub the almond butter for coconut oil? i know it defeats the purpose of being “oil free” but it’s all i have at the moment! Anna, I have not tested this, but you could try! I would only use 2-3 tbsp of coconut oil though to start out though, as it is more runny than the almond butter. Make sure it is melted too! Hi! What do you do with the other 1/2 of oats ? Just added it in! Sorry about that 🙂 You add it with the rest of the dry ingredients, it helps add texture to the bread! OMG, every ingredient is in my kitchen… Have to make this for my banana bread addicted brother (who is graduating tomorrow); he’ll be chuffed! Hi! can we use any other type of vinegar? or can we take out completely? that’s the only ingredient i don’t have and i want to make this today!! Aw no! I definitely understand that struggle! Would using regular flour work in place of the oat flour? That’s too bad. I have celiac disease and avoid avenin, so oats are out for me. hi, could u pls provide the measurement of the mashed bananas in cups? It should be about 1 1/2 cup of mashed banana! Instead of baking powder, can you use corn starch? The recipe looks delicious!! The almond butter I have only has roasted almonds but no salt added. Would that still work in the recipe or do you need salted almond butter? I made this yesterday and it came out mushy 🙁 it tastes amazing but I was so excited for a fluffy banana bread that is made with oat flour! I followed the recipe, the only thing I changed that I used peanut butter (home made and liquidy) insteadond butter and I thought it would be fine, do you think that could be the problem? You should try a lower oven temp for longer if the outside is cooking faster! It could also be the type of pan you’re using. Thinner pans tend to cook the outside of a baked good faster. If you’re using a dark pan, that might also be the problem, because they conduct more heat. Try reducing the baking temp by 25 degrees, and see if that helps. If I were to use slated almond butter should I omit the 1/2 tsp of salt? Or still use it? hey! this recipe looks delicious!! Do you think I could make this in a blender?? does the almond butter have to be runny? my almond butter is pretty thick and isn’t as runny, would this affect the texture of the cake? Could I add walnuts to this? Or would it change the bread? Could I use bananas that have been frozen and then thawed? Hi Caitlin! I was wondering what the measurement would be for oat flour. Since I don’t have to blend it, would it be the equivalent of 1 cup? This looks PERFECT! Going to make it this afternoon, can’t wait to snack on it all week. Absolutely obsessed with this recipe! Thanks so much for sharing! I made some the other day for some family. Now I am craving it today! Next time I make a secret batch for myself alone! ? Thank you for making me believe I can make banana bread finally suiting my needs 😀 Definitely first thing I’ll do when I come back home from holidays! I made it !!! It is the best!! I made my own almond butter with my thermomix, I would totally recommend you try it. I Also would try adding a little cinnamon and cardamum to make it more flavorfull!! Caitlin, this was so great! I made it once with cacao nibs and once with raisins. Thanks for posting! More gluten-free vegan recipies please! I would also love some high calcium recipies. Thanks for making veganism accessible for those of us without great kitchen skills or tons of $$! Kerry, cacao nibs sound BRILLIANT! I’m going to have to do that next time 🙂 And you are so welcome! 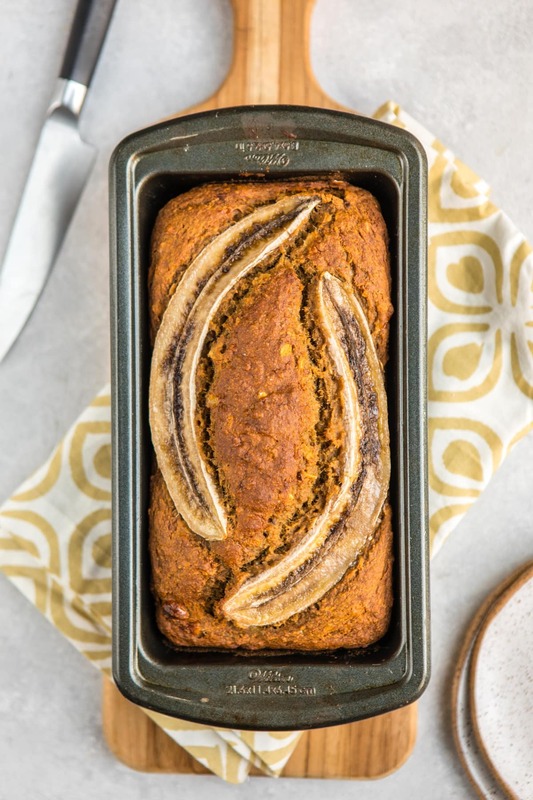 This banana bread looks perfect! I definitely would like to try it out someday! I made this…and promptly ate half of it. Is that normal? Thank you so for creating something so simple, so easy, and so delicious. hahaha I have definitely done the same thing, Audra. I’m glad you liked it! I really wanna try this recipe out soon!! I was wondering if it would be a lot easier to just use pre-made oat flour? It’s the same exact thing it’s just blended for me already. If so, how much oat float does it end up being considering that the oats take up more space in the cup than flour? Kinda confusing question sorry!! I’ll probably end up just making the oat flour myself. Hi Anna, I answered this question in one of the comments above! Hi Caitlin! I have already made this recipe four times (one is currently baking in the oven, I will bring it to a picnic tonight) and I absolutely love it! I added some chocolate chips into the loaf today and am very excited to see how it turns out. Sugar substitutions that worked really well for me were xylitol and date sugar (which is essentially dried and ground dates). Thanks to you I am slowly getting back into baking more! Chiara, I am so glad you like it! I think chocolate chips would be a fantastic idea 🙂 And thank you for the information on the sugar subs! Making this for the second time! it’s such a hearty and satisfying recipe that I love to have at home after night shifts at work. Instead of sugar, I added a packet of Vega Vanilla Protein and Greens powder, and I love the results it gave. This is definitely a staple in my recipe rotation now. So much healthier than packaged vegan bars and so much tastier. Thanks, Caitlin! I’m so glad you like it Nora! Adding protein powder is a neat idea! I just made this! I used tahini and Sugar in the Raw, and it came out just fine! I’m pretty excited about it, and will totally be making it for my family members too. Thanks for the recipe! I’ve tried 2 vegan banana bread recipes now (this is the 2nd) and left them in for a good 80minutes and the bread is still not cooked in the middle, any suggestions? I followed all the ingredients except I used regular sugar. Hi Claire, do you live at a high altitude? That is strange! If the bread is not too crispy on the outside already, you could try raising the oven temp to 370 or so. Well done Caitlin. I’m really impressed with this recipe. It’s the best oil free banana bread that I’ve tried. It wasn’t stodgy or dense at all. My kids loved it too! I used peanut butter as I didn’t have any almond butter, and it worked great. It didn’t really taste like peanuts, but I’m going to buy some almond butter and try it with that instead. Thank you! Hey Caitlin! 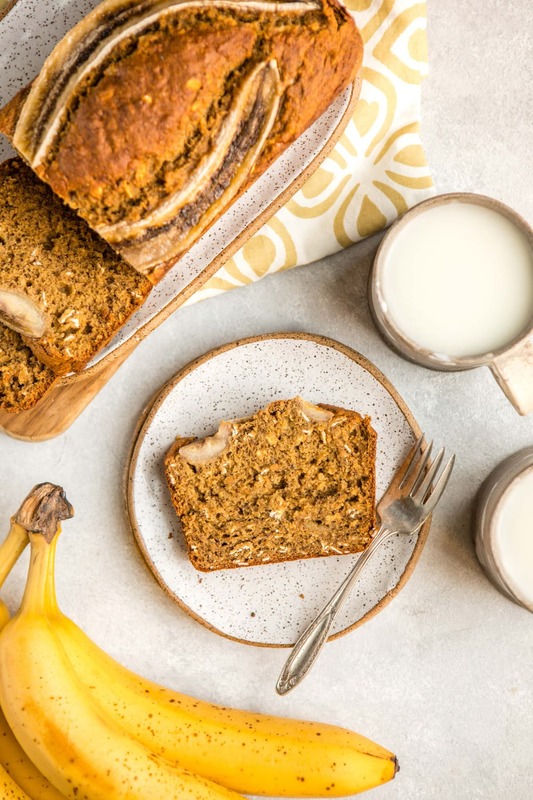 This is not really a question to this amazing banana bread but i don’t know how much is 1 cup… I don’t have those “cups” at home so i never know how much i have to use. It would help a lot if i woulf know how much ml water fits in 1 cup for example:) Sorry if my English isn’t perfect, i’m from Germany. Caitlin you’re a goddess! 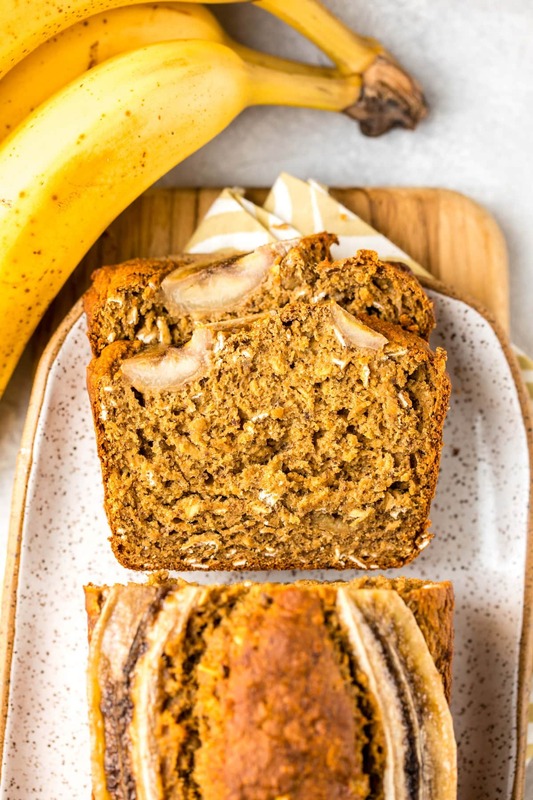 This seriously is the perfect vegan banana bread, I agree with everything you said about how dense and gummy other recipes are–but yours is fluffy and delicious! Thank you for sharing your banana bread wisdom with the rest of us! This will now be my go-to! Ahhh this was amazing. I added vegan chocolate chips and I regret nothing. I live at high altitude and had no problems with using the recipe as directed. Thanks so much, Caitlin! So glad you enjoyed it Tanya! Glad to hear it Marissa! Hi Caitlin! Hope you are well?. Just made this tonight and it was like a flavor explosion in my mouth! I’m new t vegan baking and love it! Thank you for continuing to inspire me! I subbed the butter for coconut yogurt, and used maple syrup instead of the sugar. I increased the flour a bit , oooh I’d it good. Much longer time to bake though and probably not as fluffy as yours but a good first effort! Kristen, I’m so glad you enjoyed it! That sounds so yummy! I followed the recipe exactly and as someone who is new to vegan baking, I’m so surprised at the taste. This is actually the best banana bread I’ve ever had, non-vegan banana bread included. It’s delicious! Might try adding vegan choc chips like another user has and make them as muffins next time so I can grab them on the go. Thank you so much for sharing this! That is awesome, Teresa! Many people have been making it with chocolate chips….I need to give that a try! can u opt out the coconut sugar entirely? or can I add like ⅓ cup of honey/ maple/agave ? i don’t rly like it to be very sweet so pls help me!! Shannon, you can reduce the coconut sugar to 1/3 cup if you’d like, but I would not add a liquid sweetener. I made this using tahini instead of almond butter and it turned out really good! However, it did have an aftertaste of baking powder. Are we supposed to use 1 tablespoon as the recipe calls for, or maybe just 1 teaspoon? I’m not sure whether that was a mistake. Thank you Caitlin! Hi Mariana, I usually use 1 tablespoon, not 1 teaspoon. Hi Caitlin! I watch your YouTube videos religiously 😀 btw, and here I sat for an hour searching the web for a good recipe for my ripe bananas. I wanted to avoid oil and refined sugar, but no dice! Then lo and behold I thought, “That Caitlin will have something!” And this recipe is perfect!! I’m off to bake NOW but wanted to give you a shout out for being such a lovely vegan with the best recipes!! Thank you Miranda, hope you enjoy it! My favorite vegan banana bread!! Thanks for making this awesome banana bread!!! ??❤️? Love your work ? Hi Claudia, unfortunately I would not recommended substituting PB2, as the fats are essential to helping the bread rise. Otherwise it will be soggy and dense. Thank you so much for this recipe, I’ve made it twice in the last 5 days! I also added in walnuts and sprinkled oats on top ? Hi! can we use quick oat instead of rolled oat? Would it be alright to leave out the coconut sugar completely? Courtney – You could reduce it to 1/3 cup, but I would not leave it out entirely. HANDS DOWN… this is the BEST banana bread recipe I have ever eaten. My roommate makes it all the time. I am going to try and make it into muffins and maybe add some zucchini, applesauce and walnuts!! So glad you like it Lacey! Sounds like a yummy idea 🙂 Maybe I’ll have to turn that into a blog recipe! Just made this but only used 3 tbsp almond butter/peanut butter, 1/3 cup coconut sugar and then added 1/4 cup applesauce with the chia seeds instead of water and 1 small yellow squash. Baked for about 65 minutes in a glass baking dish and it came out PERFECT!! this. is. phenomenal. I keep eating more because I’m utterly in shock. So glad you enjoy it Kylie! Hey Caitlin, love your blog! Kinami, I’m sorry that happened! It could be your bananas are too large, because that might create more moisture and make the bread more dense. Generally speaking, it should be about 1 1/2 cups of mashed bananas for this recipe! Hi! I so want to try this recipe! There only thing, I live in Brussels, Belgium. And I’ve been looking for apple cider vinegar for a while but can’t seem to find it! Can I substitute it for anything else like lemon juice or another vinegar maybe? Thank you so much for all the effort and dedication you put into your channel and blog! I admire you for being vegan and admire you for the amazing personality. And you’re not the only one who eats raw greens straight out of the bag without anything on top.? I never miss a video and it’s becoming hard to find videos of yours that I haven’t seen yet! Could I freeze slices of this bread and then thaw them? Also, I don’t have any apple coder vinegar so I was thinking if maybe I could use lemon juice instead? I’m making this today and I can’t wait to see how it turns out! LOve this….Can I leave the coconut sugar out and replace it with maple syrup and/or date syrup? Wow – this is so, so delicious! I made it with what I had available – subbed peanut butter for the almond, and dates that I processed in the food processor for the sugar. I also added a bit of cinnamon and maple extract. They are incredibly delicious! Thank you so much! I’ll definitely make these again! So glad you enjoyed it, Cara! Yum! I made this today and waited for it to cool to cut a slice. So good! I used about 2 1/4 cups (as suggested above) of Bob’s oat flour instead of making my own oat flour. I also topped it with chocolate chips and pecan pieces. Will definitely make it again! Do you think I can replace some of the oat flour with cacao powder (like 1/2 cup or more???) to make a chocolate banana bread? Would it affect the texture? Thanks so much again for the delicious recipe! Hi Alicia, you can sub the ACV for lemon juice. Oat flour can be substituted for Buckwheat Flour but I would not recommend it. The bread will not be as fluffy and will turn a very dark brown color. Just wanted to let you know that I make this recipe almost weekly by in muffin form! My kids and husband love it. I stick a couple raspberries in the center of the muffins before baking and wow! Love ya!!!!! I’m so glad you all enjoy it, Rebecca! Raspberries sound like a great idea! I am obsessed. Absolutely, 100% obsessed. I made two loaves three days ago and they’re both gone! Thank you sooooo much!!! I should add I’ve made it twice now with spelt flour and the only really difference is that the outer layer is almost crust like but not quite – still soft and spongy on the inside. However, it does alter the taste to a less sweet Banana bread and so would probably add more sugar to combat this. I haven’t had any complaints from my family and they usually hate my vegan baking. But great recipe and I can’t wait to try it with Oat flour next time ? Wow! This was the BEST banana bread I have ever eaten and my husband said the same thing! Go funky with that. Add clove, cinnamon, some rasins, dice sliced apple .You can put on top some stuff like peanuts, grains etc. This banana bread was DELICIOUS. Seriously, it is absolutely perfect all around. Thank you so much for sharing your amazing recipes, they’ve really made going vegan a lot more enjoyable! Hi Caitlin! I am wondering can I subs baking powder to baking soda? Will it be any different? Bomb.Com! Thanks so much for sharing~I used stevia instead of coconut sugar and added one extra med size banana ? moist and delious clean eats ? Hi thanks for this recipe! I’m allergic to most seeds and can’t do flax or chia. What do you recommend I substitute with? Also can I just use bob’s red mill oat flour instead of grinding my own? Is there a benefit to the self ground flour? Yes, you can use store bought oat flour! It’s just less expensive for me to make my own, as I already buy the oats. You can substitute another vegan egg replacer for the flax and chia, or just leave it out. The bread may be a little more dense, but it should still be fine! Can I used whole chia seeds to make the egg or do I need to ground it up? Thanks for sharing this recipe!!!! Mine came out a bit dry and very burnt looking. I did modify the recipe a little by adding 1 teaspoon of cinnamon & 1 teaspoon of nutmeg. Plus less sugar. Not sure why it came out so dry (edible). Next time I will only put in for 45mins. We’ll see how that goes. Too bad I can’t upload a pix here to show you how mine turned out. IT WAS SO FREAKING DELICOUS!! I didn’t have almond butter so I used peanut and I also decided to blended all the oats, and I decided to make banana muffins instead of bread. This is by far the best banana bread I’ve ever eaten ( especially since it’s so healthy compared to some others). Thank you so much for sharing this delicious recipie I hope you can make more! How long did you bake the muffins? Tried this yesterday and it’s absolutely perfect. I agree with you that regular banana bread can be too soggy, but this was perfect. The second batch I added some coconut shavings and some walnuts and I thought it was even better. Thank you! I am in Banana Bread heaven!! I haven’t made any Banana Bread in probably 10 years. I am now WFPB and gluten free, so I never attempted to bake it. This recipe is absolutely delicious. I couldn’t wait for the bread to cool before eating a slice. I will be making this again soon!!!! Does this recipe work at high altitude? If not, do you have any suggestions? I’m trying to get into baking at it’s really hard at 8,000 ft especially for gluten free! Hi Melissa, I live at sea level (Miami, haha), so I cannot say for certain! Will quick oats ruin the recipe? I feel like I stock up on quick oats & steel cut oats for most of my meals but don’t seem to have any rolled oats! No, quick oats are fine! Just made this and it is sososoooooo good! I’m telling people left and right about this recipe haha. So moist and chewy with the perfectness sweetness. I’m thinking of making this recipe again but double the ingredients in a bread tray. Do u think that would work? Should I change up the temperature or maybe cover the top with aluminum foil so the top won’t burn as the middle will most likely take longer to cook? I made it yesterday and it is delicious. The only issue for me is that I feel it a bit too dry for my taste. Maybe I can try omitting the remaining 1/2 cup of rolled oats? Or lowering the temperature? Wonder which one will yield the results I want. Thank you so much for sharing!!! Sure, you can omit the oats! I omitted the half cup of rolled oats as I thought it could have been fluffier too and let me tell you, it worked! I am for sure going to try this recipe! I have been a fan of your youtube channel for a long time now, and I’m just kicking myself for not checking out your website sooner! You are such an amazing and talented person can’t wait to see what recipes you come up with next! I usually never comment under anything, but this recipe is absolutely fantastic. My entire family loved it. I didn’t have access to oat flour, so I used whole grain spelt flour and it turned out great. This looks great! I love GF recipes that don’t require a bunch of different flours! Unfortunately, I only have instant GF oats. Will these work in this recipe? In order to make this gluten free can I swap out the oats for gluten free oats? Can u make this recipe without Apple cider vinegar and substitute with lime juice? I would recommend lemon juice, but not lime. Thanks Caitlin! will definitely try it. I’ve already baked this banana bread once before and I loved it! I ate a whole loaf on my own during a weekend. I was thinking of making muffins so I could try and have some self control lol. Would you have any idea on how long I would have to bake them for? Thanks! Hi Elizabeth! I turned this bread into muffins in my Chunky Monkey Muffins recipe, so I would follow those instructions – bake at 350F for 35-40 minutes! Could you use other flour, such as almond flour maybe???? Could you use packaged oat flour instead of processing your own? Yes, just use a 1:1.25 substitution ratio! I made this recipe but I baked it at 325 on the bottom rack of my oven. It came out great; sweet but not too sweet and rose pretty well. Sadly, after it cooled it deflated and was slightly more dense than I expected it to be. Do you have any tips to keep it from becoming more dense as it cools?? Hi Diana, perhaps you did not cook it long enough? Love this recipe turns out a treat every time. Is it ok to freeze after it’s cooked & cooled? Anxious to try this recipe but I can’t have vanilla- could I substitute almond extract time should I just not add any flavor extract? Thanks! Guys! Try using half the amount of “egg” it makes the bread so might lighter, airer! I’ve been making this recipe for a while, decided to double it but forgot to double the “egg” and it turned out delicious!! This is hands down my favourite banana bread recipe! 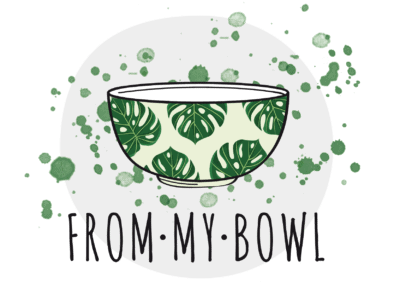 Its so fast and easy to make and it tastes soooo good, so thank you Caitlin! I’ve made this recipe twice already, and each time it comes out so crumbly. I can’t cut it into slices because it just doesn’t hold. So sad! The taste is AMAZING and I really want it to work. Any ideas on what I’m doing wrong? Hey there! Your nut butter may not be runny enough, OR you could be packing too much flour into the cups when you are measuring it. You are technically supposed to spoon the oats into a cup, level it off, and then only use those. Thanks so much! I will try again as soon as I get more bananas!! I baked it today and OMG! Best banana bread ever. Thank you for share the recipe. Thank you for the recipe! this was so delicious! I have tried different vegan options, and this one is by far the best! The only thing that it did not raise at all (maybe 10% vs. uncooked butter). I followed all the steps in the recipe, and substituted almond butter with peanut one. What could be the reason? I made this and it was AMAZING! I did replace the coconut sugar with organic stevia. It was soooo yummy and I was super surprised at how moist it was, even without oil. Thanks for a delicious recipe! Do you think coconut butter would work in place of almond? Yes, it should be fine! Made these for my mom for Mother’s Day, they are so good! I made them into muffins and cooked them for about 20-25 minutes and also added some stevia sweetened chocolate chips. Excellent recipe!! I made this and my family really liked it. This recipe is a keeper for us. 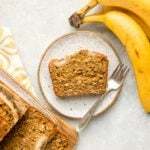 Is it possible to know the calories for a piece of this banana bread? Hi Mina! I do not calculate the nutritional information for my recipes, but there are plenty of free calculators online where you can input the information yourself. Just made this. Had no coconut sugar so I used unrefined cane sugar. Made the almond butter myself. Used homebrewed kombucha instead of ACV and added chopped pecans. Everyone loved it even more than the one my wife makes with regular flour. Thanks for the recipe. gotta give it to you, caitlin. your recipes are all super easy to follow and i love the clean ingredient list. this bread turned out perfectly on the first try…which is great because we doubled the recipe! we made a couple changes. added a pinch of cloves and cinnamon, subbed half hazelnut extract (cuz we ran out of vanilla). thanks a bunch! ooh yum – that sounds great! Thank you Carmen! This was amazing! Exactly like the picture and so moist and fluffy I was literally jumping up and down! Banana bread has always had a sort of taboo on it for me so this saved my banana bread deprived life. Absolutely the best vegan banana bread ever! I tried so many different recipes in the past and have few favorites. However, this one is the bomb!!! The texture, flavor, and the taste are perfect! Has anyone tried to double this recipe? I’m not very experienced when it comes to baking but I’ve heard that one has to be careful when doubling recipes. If you double it, I would still cook it in two separate loaf pans 🙂 but otherwise it should be fine! I’ve made the bread twice now. I didn’t use coconut sugar and didn’t feel the need to replace it with any other sugary thing. I did replace almond butter with peanut butter, instead of vanilla extract I used 1 bag of vanilla sugar (~10grams) and instead of baking powder I used winestone (that’s the literal translation anyway). First try I left out the 1/2cup of whole oats, I used ~6g of winestone and I baked at 180°C for 75min.It was tasty but the middle was a little wet and it fell together. Second try I used all of the oats, used the remaining winestone(~12g) and I baked at 170°C for 75min and it came out much nicer, it is bigger and actually fluffy. The slice on the edge was heavenly, I just hope the rest of it is also baked otherwise I’ll have to tinker with the recipe a bit more. Hi Simon, leaving the Coconut Sugar and some of the Oats out will definitely make a difference with how the bread bakes in the oven. I’m glad you found a method that is working for you with your modifications! Caitlin, I’ve tried many quick breads made from oat flour and your recipe is hands down the best! The bread was indeed fluffy, and doesn’t have the gumminess that oat flour breads usually have. There was also a nice crunch on the edges and from the unground oats. I used two chicken eggs in place of the flax eggs, brown sugar (about 2 tbsp short of 1/2 cup as I prefer a less sweet bread), natural peanut butter and baked the bread in a 9” metal pie pan in a toaster oven for about 48 min and it turned out perfect. Thank you so much for experimenting and sharing the recipe! Sorry, I forgot to rate the recipe. It’s definitely a 5-star! If I want to bake these in a 12 muffin pan, what would the cooking time be? And same temp? Thanks! 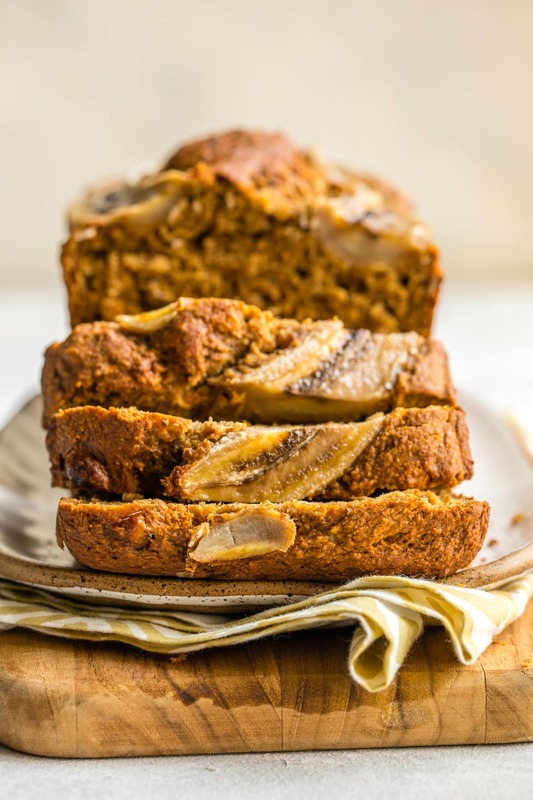 This is an outstanding recipe and will definitely become my go-to banana bread! It’s fluffy, but still moist and my family is probably going to finish the loaf in one day! The best part is that it’s healthy but taste like the original!! Great recipe! I added a cup of fresh raspberries and half a cup of chopped dates….delicious! I have failed at a modified version of this recipe, repeatedly, and would greatly appreciate any advice. The first attempt, was to the recipe, using coconut sugar. It was okay, but took more time than advised to bake. 1 cp. oat flour + 1/2 cp oats, 1 cp. coconut flour. Reduced to two ripe bananas, to limit moisture, based on past experience of undercooking. I am substituting organic, unsweetened applesauce for sugar, and 1/2 cp. garbanzo bean water (aqua faba) mixed (whisked with fork) with 1 tbsp. ground flaxseed. Baking for 70 mins initially, up to 85 mins. The last attempted loaf did not rise, and the middle was significantly undercooked, while the crust was overcooked. Again, any suggestions would be greatly appreciated!. I didnt have any vinegar so i squeezed some lemon and used it as a replacement for the vinegar, i also added cacao nibs and some sliced bananas on top in came out great! Made this delicious recipe last night, OMG!!!! I used half the amount of coconut sugar and added a little applesauce, maple syrup, cinnamon, and raisins. Delish! I have been on a banana bread kick lately and this was definitely my favorite recipe so far. Thank you! Yum! Thanks for the review! Quick question – do you recommend 9×5 loaf pan or 8×4. I want to make sure I get the texture right. I use a 9×5″ pan! If I didn’t want whole oats in my bread, could I replace that just with another 1/2 cup of oat flour? Or what do you think would work best? Yay! So glad you liked it Hannah! My family LOVED this recipe!! I made some subs according to other reviewers. I only had 2 ripe bananas, which only equated to 1 cup, so I used 1/2 cup unsweetened applesauce. I used the flax meal for my “egg”, cashew butter in place of almond, and raw turbinado sugar in place of coconut. My batter was a little thick so I added 1 Tbsp unsweetened almond milk. Mine only took about 45-50 minutes to cook. It’s amazing! Thank you!! I’ve had this recipe in my bookmarks for ages and finally got around to make it ! I had tried different vegan banana bread recipes before without being completely satisfied but this was perfect ! Followed the recipe without substitutions (except that I divided all ingredients by 2 for a smaller pan) and it came out great, cooked within 30 min because the pan was smaller. I tried it when it was still hot and it felt too sweet and a bit too wet but it was perfect the next day after being completely cooled down. This will become my nex go-to recipe 🙂 thanks ! Sounds so good. I’d like to make these into muffins – should I just bake for about 25 – 30 min instead? Yes, I would start with 25 minutes and go from there – just make sure a toothpick comes out cleanly! Would gluten free rolled oats work the same? I don’t think my other question posted so I’m asking again (just in case). I noticed some people were curious about doubling the recipe. I, on the other hand, want to halve it. What size baking pan would you recommend for half of the amount, and how long do you think it would take to bake? Also, I really want to add walnuts to the recipe – I was thinking 2 or 3 tablespoons of chopped walnuts. Do you think that would work? I apologize for all the questions. I don’t bake often but my husband really loves banana bread and I want to surprise him with this one. Thanks in advance for any help you can offer. It honestly looks divine! Yay! Glad to hear you enjoyed them, Vanessa! Great recipe! I’ve made it a few times now. I just made a loaf and added a 90% dark chocolate bar chopped roughly….so good!!! Hi, today I made this awesome banana bread. I used frozen bananas and no sugar. Instead I took some raisins. Peanut butter was the only nut butter I had…homemade and not runny – I thought that the result would be ok for me (no guests 😉 ) but it turned out fluffy and delicious. The bananas are sweet enough and next time I will use some cinnamon too. Thanks for this easy and surprisingly alternative-friendly recipe! Hello! I don’t have any oats currently, so I substituted it with a gluten-free flour mix. The bread was a little dense but other than that, I loved it! Great job with this recipe! Hard to believe its gluten-free and vegan! I found your blog today when looking for a gluten-free, vegan banana bread to make to use up some over-ripe bananas. I was happy to see I had everything on hand! I followed your exact recipe, except I used steel cut Irish oats (the 5-minute kind, as that was what I had) and I added a tsp of cinnamon. The steel cut oats took longer to blend into four, but the result was a really beautiful hearty bread – I was impressed! It was more bread-like and less quickbread-cake-like as the banana bread I am used to, but it was a delightfully unexpected change! The outside had a perfect crust and the inside was indeed fluffy with good crumb. It was not mushy or dry in any way. My bread only had a slight banana taste and was only slightly sweet, making it a great base for toppings that I wouldn’t normally put on banana bread, such as jam. I will definitely make this again and try it with regular rolled oats to see if there is a difference. Thank you! so. freaking. good. this is the very first “healthy” banana bread i’ve made that has actually worked!! and WELL!! i’m a recently diagnosed celiac and i was really getting frustrated with all the nasty, gummy banana bread, haha… i used 1 cup of oat flour and 1 cup of almond flour and it worked beautifully… i am also ovo-vegetarian as i am allergic to milk and don’t eat meat for ethical reasons, so i used two eggs from our neighbor’s backyard chickens… it was nice and fluffy- in the future i will try flax as well and see how that does!! next time i’d also add walnuts. thanks caitlin- you’re the best!! Great to know that Almond Flour works too! Hey!! 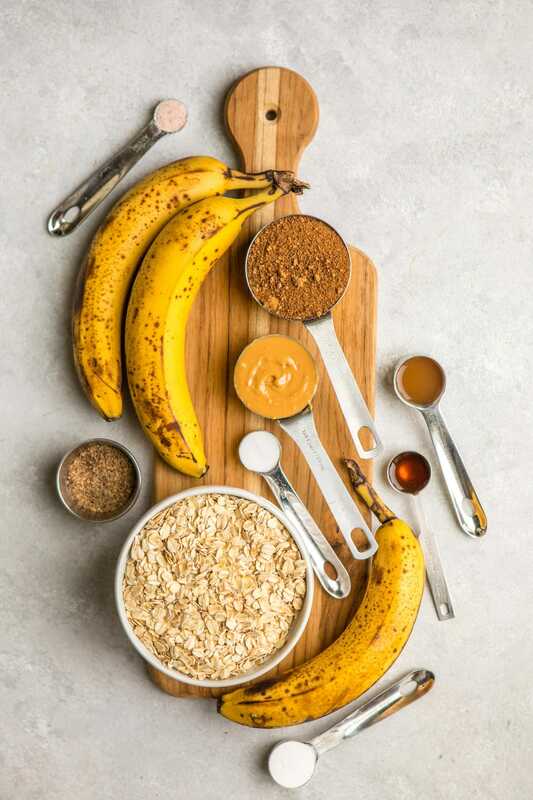 I wanna make this for my roommate but she is allergic to nuts…is there another nut-free substitute for the almond butter? You can use Tahini or Sunflower Seed Butter! I think this is among the moxt imkportant information for me. normal things, The web site style is great, the articles is truly great : D.
I’ve now made this recipe FOUR times this holiday season and it’s amazing. This most recent time, I accidentally forgot to add the flax egg and I think it turned out even better! Baked for 50 minutes and it was super moist with even better banana flavor than before. And it held up just fine! highly recommend that tweak. It is so nice to have someone who eats the way I eat, and knows how to make so simple, though tasty, recipes. Everyone always behaves as though it is impossible to eat tasty food that is vegan, gluten free and oil free. Your recipes are the proof that it is not right!!! Thank you! I wanted to ask how many ml do you have in your measuring cup? Hi Marva! You can reduce the sugar if you’d like, but I wouldn’t recommend leaving it out. It does help add texture and fluffiness to the bread. Hi Caitlin! Thanks for your answer! Do you use raw apple cider vinegar? I made this recipe once and very good! Probably the best texture of vegan and oil-free banana bread😍So you think date sugar would work? I haven’t tested it, but if it has the same consistency of brown or coconut sugar it should be fine! I made this 3 days ago and followed the recipe almost exactly (which I never do! lol) and it came out… perfect. I didn’t have coconut sugar so I subbed brown sugar (which I blended very fine) and omitted salt. I made it again tonight and this time decided to weigh the 3 bananas (14 oz), sub the nut butter for applesauce, use sucanet for sweetness and omit salt. I blended bananas, sugar, applesauce, baking powder, baking soda and apple cider vinegar in vitamix on low speed rather than mashing and hand mixing. I even added the sliced bananas like you did and it looked so gourmet. It turned out fluffy and moist… absolutely delicious! Thank you for this amazing recipe, Caitlin! Hey Caitlin, love your recipe. SOO YUMMY. I’ve been making it about twice a week. I note es yesterday though that you changed it slightly. Doubled the vinegar and added a tsp of baking powder. I had do do a triple take and eventually thought that I had somehow crossed into a parallel dimension in which the only difference is this change in recipe. I’m questioning the boundaries of our objective reality here and suddenly find that I can’t trust anyone anymore. I’m trying to find a way out but all I can do is hope that things will somehow return to normal. That I’ll wake up and realize that this has all been a dream. What is the truth? Either way, love the bread. Ps. I’m we add dairy free choco chips and walnuts. Serious yum yums. Lol! Yes, I updated the recipe slightly – the flavors will still be the same, but the bread itself will be even fluffier now! Hey Caitlin! I’m stoked to make this tomorrow, just one question: if I use store-bought oat flour, how much will I need? I unfortunately only own a food processor which will probably have some trouble blitzing whole oats into a fine flour, and I already have some store bought oat flour lying in my cupboard. You can use the same amount of Oat Flour – 2 cups! Can I add frozen blueberries to the batter? Or would it affect the structure? That should be fine, I think you could add up to 1 cup – just fold them in right before baking! Caitlyn you have out done yourself! Holy cow this banana bread is perfect! You can tell that it is not your standard oily sugary banana bread but that’s why it’s so good. Just the right about of sweetness! Thanks so much for this healthy banana bread recipe. Could I use old fashioned rolled oats to make oat flour? If I don’t have apple cider vinegar on hand, can I substitute it with something or leave it out, or do you think the recipe would flip without it? You can substitute with lemon juice, or distilled white vinegar! Delicious! I panicked because I had no ACV so I used fresh squeezed OJ instead. It rose beautifully and did not sink. I also used brown sugar instead of coconut and added Walnuts. So good. My first successful vegan banana bread. Thank you! Woo! Thanks for the review, Shelly! The first gfvegan nonprocessed sugar bread recipe that WORKED!! Not gummy or gooey and just the right amount of sweetness as I don’t eat sugar. This bread is delish. Thanks so much for all your hard work getting this bread right. Much appreciated!! This bread turned out delicious. I Just wanted to say that I successfully used steel cut oats to make the oat flour and it was still fluffy, moist, and delicious. The oats just need to be blended for slightly longer in order to get them to a fine texture. Great to hear that, Taylor! Hi Caitlin! I made this recipe today with buckwheat flour and it was amazing! So impressed by the fluffines! Hi Caitlin I was wondering if I can make this bread without any sugar? Just the sweetness of the bananas? What do you think? Extremely fluffy and delicious! I just love it!!! Amazing!! Thanks so much for this awesome recipe. I made them into mini muffins and they turned out great. Love the idea of mini muffins! Could you please tell me how/when did you put the bananas on top of the bread? I’m gonna make it this weekend! It looks amazing! Thanks for another amazing recipe beautiful! I’m just about to try this recipe, which by the way looks amazing, but I don’t have baking powder. Can I just add 3tsp of baking soda instead? I made this bread in a heart shaped pan for a fun Valentine’s Day breakfast for my daughters. I added some coconut cream icing and it was a big hit! Seriously so fluffy!!! 7 year old picky eater approved!!! That’s so great to hear, Rachael! Hands down the BEST banana bread recipe I have found! I forgot to buy Apple Cider Vinegar so substituted with fresh lemon juice and it was delicious! I’ve had such bad banana bread cravings lately, ever since watching your banana bread video. Waiting for my bananas to ripe was such a torture! My loaf of this heavenly smelling banana bread is baking in the oven, can’t wait to dig into it!! Great to know that rye flour can work too! Thank you for this yummy recipe! I’ve made it twice already and it has been a huge hit with my sweeth toothed partner 🙂 I would love to make it for my parents, but they are sensitive to many kinds of sugars. Do you think substituting with dates or a super ripe mashed banana might work? The only problem with this recipe is it will get eaten very quickly! I have made this recipe twice now and it is the BEST banana bread recipe I have ever tried (even compared to non-vegan recipes). I substituted 1 1/2 cups of whole wheat flour, I also used less coconut sugar (about 1/4-1/3 cup) and added chocolate chips. It turns out amazing every time. Thank you for this amazing recipe, Caitlin! Hi, do you have the nutritional info for this? Andd can the sweetener be omitted? Tried it with a cup of spelt flour, cup of coconut flour and spelt flakes. Super delicious!